A great lookalike of a Frye boot, I have these in brown and would definitely recommend them to anyone. A flat motorcycle boot is always a classic. Carlos by Carlos Santana Unity Boots - $119.20 - Click HERE to purchase. I own these in brown and love them. You can also see them frequently on Sydney over at The Daybook blog. 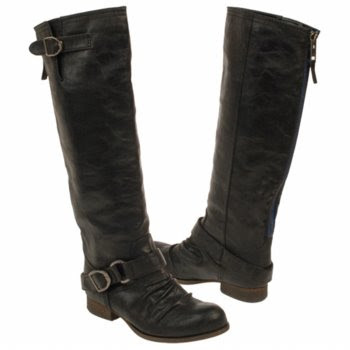 Nine West Maeble Boot - $54.42 - click HERE to purchase. Thank you for the great suggestions! I am getting the Carlos Santana Unity boots and the Sam Edelman Lakota boot. Possibly thinking of getting the DV Pascal bootie..love the taupe color! Check local famous footwear. They sold Carlos Santana Unity boots (in brown and black) for only $55! I believe they're sold out on the website although they may still carry in-store!